AZ Prime Property Management is so confident of our tenants placed that we provide property owners what we feel is the absolute BEST tenant guarantee in the Valley! UPDATE: We have increased our prior 6 month Tenant Guarantee now to 12 Months! 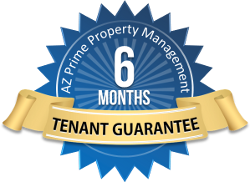 AZ Prime Property Management Tenant Guarantee applies to all tenants placed and managed by AZ Prime Property Management with leases beginning on or after June 2011. Please note the Tenant Guarantee does not cover any legal or eviction costs, lost rental revenues from vacancy/ non payment and any damages to property. Note we take over management accounts frequently from other firms and many of them turn into evictions due to poor tenant placement by prior firms; we are unable to offer our guarantee on tenant accounts that we take over.